It has been more than three weeks since Cambodia’s commune elections. 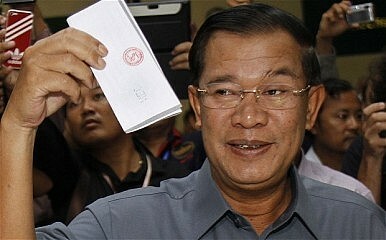 But one issue flirting on the edge of debate has been the Senate, Cambodia’s upper house. But Mu Sochua, vice-president of the opposition Cambodia National Rescue Party (CNRP), was maybe on to something when she said the Senate was the “crown prize” of this month’s commune election, though in ways she probably didn’t intend. Prime Minister Hun Sen also referenced the Senate in a celebratory Facebook message after the election, which his party won. The CNRP “campaigned saying that in 2017 they would take the communes and the Senate,” he wrote, but the ruling Cambodian People’s Party (CPP) will “continue to lead with a majority of the votes in the Senate”. A little history is necessary before continuing. In 1997, Norodom Ranariddh, of the royalist FUNCINPEC party, was ousted as first prime minister in a coup. But two years later, he accepted a coalition agreement to work under the Hun Sen government, which meant he had to be found a suitable position. Accordingly, he was made president of the National Assembly. However, that meant Chea Sim, one of the CPP’s top men, who had been the lower house’s president since 1993, also needed a new post and power base. Indeed, senators are undemocratically elected. Fifty-seven seats are decided by the country’s commune councilors and National Assembly members; two are nominated by the King, and another two by the lower house. As a result, the Senate’s makeup largely reflects the distribution of commune council seats, which brings us back to the present day. At this month’s local election, the CPP took roughly 71 percent of the communes; the CNRP won all but one of the remaining communes. We can now safely say that when the next Senate election takes place, on January 14, it will remain a body dominated by the CPP, which currently has 46 of the 61 seats, though its supermajority will probably be dented slightly. And the party will almost certainly continue to hold the Senate presidency, a position currently occupied by Say Chhum, a CPP-loyalist who also serves as the party’s vice-president. Importantly, when the King is absent, the Senate president becomes acting head of state. If the presidency and majorities of the Senate and the National Assembly are held by two different parties, it serves, from a legislative perspective, as a balance of power that manages to prevent the National Assembly from adopting laws freely, and the Senate can spot gaps in the laws and send them back to the National Assembly. Of course, at the moment, this doesn’t happen because the CPP dominates both houses. But let’s engage in a little thought experiment. Say at next year’s general election, the CNRP does win (and is allowed to form a government, which is far from certain) then it will control the National Assembly. But the CPP will still control the Senate. In such an eventuality, the Senate actually becomes very relevant. Although it has not happened before – because the Senate today simply rubber-stamps what comes from the National Assembly, analysts say – it does have the ability to reject laws that come from the lower house. As far as I am aware, any draft law sent to the Senate, if rejected, cannot be reconsidered by the lower house for a month (though a quicker time frame is possible for state budgets or urgent matters, such as declarations of war). The Constitution, though, remains unclear whether the National Assembly has the power to bypass the Senate but, from what I have been told, it doesn’t. Senators can also propose legislation. But it is hardly the worst situation, which would probably be following through on Hun Sen’s threat of civil-war and hundreds of deaths if his party loses. This might have been “acceptable” in the 1990s but today, with a globalized Cambodia reliant on Western nations for exports, it would be too economically dangerous. One only needs to look at what other Southeast Asian autocrats have done to guarantee power in one of their houses. Thailand’s 1997 Constitution, for the first time, made its Senate directly elected by the people. But the 2007 Constitution, passed by a military junta following the 2006 coup, halved the number of elected senators; the other half were appointed by the military. Thailand’s most recent Constitution, accepted in a referendum held last year and again imposed by a military junta, will make the Senate fully appointed by the military. Why the changes? Put simply, in the event that another election is held again in Thailand and a pro-democracy party takes control of the National Assembly, then the military will retain veto powers on almost all political questions. Indeed, Thailand’s Senate will become a stranglehold allowing the military to destroy any future attempts to reform the Constitution. Its future power is, thereby, assured because of the Senate. Interestingly enough, the Cambodian government has already pushed through a new law on the Senate this month. Another seat will be added to the upper house, taking the total to 62. More importantly, if a political party boycotts the first Senate session it will have its seats taken away and redistributed to another party, Ouk Bun Chhoeun, a CPP senator and chairman of the Senate’s legislation commission, told Chinese media. It will be interesting to see if any more changes take place in the coming months. For a second example, let’s turn to Myanmar for a moment. One of the big questions after the success of the National League for Democracy (NLD) in November 2015 election was why it was allowed to form a government, when previous electoral victories were overturned by the country’s military governments. An explanation was provided by Maung Zarni, a political commentator, who thought that the military leaders had little to lose. In fact, Zarni described it as a “win-win” for the generals. First, they got to keep a great amount of power because of the how they wrote the Constitution in the 2000s, which grants them automatic seats in parliament and considerable leverage over important state matters. Second, they could continue to grow fat from their “ill-gotten gains,” as Zarni put it. Indeed, allowing the NLD to form a government meant that they would no longer face accusations of being undemocratic, while Myanmar’s remaining economic sanctions would be lifted – as U.S. President Barack Obama did during his time in office – allowing them to grow richer. Could such a scenario take place in Cambodia next year? With control of Senate, the CPP would be able to reject CNRP-designed laws from the National Assembly that effect the business ties of party members or corruption or nepotism (perhaps weakening the CNRP’s popularity among the electorate in the process). At the same time, the party will still control the armed forces (a CNRP government is unlikely to weaken the bonds between the military and CPP) and continue to have the ear of much of the business community. Whichever way one looks at it, the Senate has become a factor in politics in ways it never was before. Moreover, next year’s general election might not be the deciding factor of which party controls of Cambodia as much as some would prefer to think.